Coverage: Watch live on BBC TV, Red Button, Connected TVs, BBC Sport website and mobile app. Listen on BBC Radio 5 live, 5 live sports extra, BBC Sport website and app. Live text coverage on BBC Sport website and app. Ireland and Lions great Paul O'Connell makes his BBC Sport website bow this year, joining fellow BBC pundits Jeremy Guscott, Jonathan Davies and Andy Nicol in casting his eye over the 2018 Six Nations. Between them they see only two sides as contenders to win the tournament - although they all agree who's going to finish bottom. There's also wide agreement on both the player from the opposition they'd most like to have in their team, and who the most exciting youngster is. How do you expect your team to get on? JG: England haven't been at their best in the last 12 months, and further disruption with injuries won't have helped. But winning becomes a habit no matter who is in the team and they face Italy, the weakest side, to start so can ease themselves into the tournament. I suspect Scotland and Ireland will be their toughest challengers. JD: Wales losing six of their best players - Rhys Webb, Liam Williams (for the first game), Jonathan Davies, Dan Biggar, Sam Warburton and Taulupe Faletau - will have an effect. That's over a third of your starting XV. However, Wales are looking to change their style of play so this could be a great opportunity - the likes of Rhys Patchell, Josh Adams and Steff Evans have to come in and impress. POC: I think Ireland will win. AN: I am very hopeful of a good Six Nations for Scotland, after such a promising autumn, which culminated in scoring 50 points against Australia. The key is the first game in Cardiff and if we can win that, it will set us up nicely with two home games to follow. Who do you think will be your nation's key player? JG: Fly-half George Ford is the key to England's attacking game. It's been far too long since he's consistently threatened the gainline with his running game - his influence has been more as a distributor in the deep rather than a threat making breaks. If he can rediscover that side of his game, England will be an attacking threat in the backs, which would make a pleasant change. JD: Patchell, and his half-back partnership with fellow Scarlet Gareth Davies, is going to be key. Who are Ireland's young stars? The Scarlets fly-half is an intelligent player, who is playing well in a confident side. The front five is solid so it's going to be a case of how well Patchell can manage the game and implement the new gameplan. POC: Johnny Sexton will be Ireland's key player. The out-half will be key on every team but no other out-half in the competition has his experience. He is obviously a fantastic player but also a great leader and on-field coach. AN: Every successful team needs a stand-off who controls the game and can produce moments of magic, and Finn Russell is that man for Scotland. He plays with such positivity and loves to play with real tempo, which brings out the best in the other players. Six Nations 2018: Can England make it three in a row? Which Six Nations player from another team would you pick if you could? JG: Scotland full-back Stuart Hogg would add another dimension to England's attack. He has speed and a great step, and can pop up anywhere in the attacking line and have a go at defenders - he's a real threat. The attacking full-back is iconic and we need to see more of them. If Anthony Watson played 15 for England it would be good news for their attack. JD: Hogg. With the way Wales are trying to play, I think the Scotland full-back would have a huge influence. England's Owen Farrell would be brilliant at 12 but with Wales trying to now put the ball through the hands, Hogg would be a great addition to the side. POC: I don't know where I would put him but I'd take Farrell. Coaches can sleep well when they have players like the England man in their team, someone who drives his side continuously to higher standards. 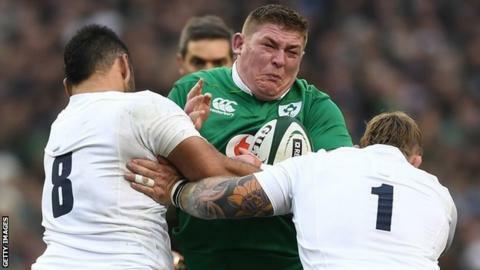 AN: Tadhg Furlong from Ireland. With injuries to just about every prop in Scotland, but especially WP Nel, I would take the world class Ireland tight-head to lock out the scrum and give Scotland a guaranteed platform to play from. Which youngster do you expect to make a name for himself? JG: If Jordan Larmour gets a run for Ireland he's definitely one to watch. The 20-year-old Leinster full-back/wing has quick footwork with decent acceleration. If he doesn't make it, Ulster's Jacob Stockdale will catch the eye. The 6ft 3in, 16st Ireland winger appears to be a natural, try-scoring predator. JD: I'm looking forward to seeing Larmour on the Test stage. He's a really exciting prospect. POC: Larmour. I think Ireland will be careful with him and put him in at the right time. He has scored some sensational solo tries this season and is profiting from working with some great players and coaches at Leinster. AN: If Bath number eight Zach Mercer or fellow 20-year-old Larmour get a run for England and Ireland respectively, they could make a name for themselves. What is the biggest obstacle to your team's success this year? JG: The loss of Billy Vunipola is the biggest issue for England - he carries so well and is their best attacking player. A very close second is the quality, or otherwise, of the attack from England's backline. Which player in the England three-quarter line has consistently been an attacking threat, making breaks and making or scoring tries? The backline hasn't found its balance. JD: Wales' injuries are going to be significant, as is the comparative lack of strength in depth. England go on about their injuries but they have great strength in depth and injuries do affect the other nations a bit more. POC: Ireland's biggest issue is that in a season when we have form and such depth, we have France away in the first game and England away in the last game. England at Twickenham will not be easy and recently our record at Twickenham isn't great. AN: Injuries to the front row could really hamper Scotland's ability to guarantee possession. They have no real strength in depth at stand-off either, so Russell needs to play all five games. Who will win the title and why? JG: For me Ireland are the most complete team. They have experienced players, new talent coming through, the scrum and line-out are solid, the breakdown pretty precise. They are a side that has a low penalty count and work hard to keep unforced errors to a minimum, which compounds the pressure they apply to teams. Their gameplan is embedded, well structured and executed, and they have the best half-back combination in the tournament in Sexton and Conor Murray, who are rugby smart and perform to the highest standards most of the time. JD: If Ireland win their first game they will have a great opportunity because of their three home games, but I think it might come down to the last game - England v Ireland at Twickenham. POC: Ireland, for a number of reasons. The depth of the squad has never been so good, so I think they will be able to handle the injuries that will come during the tournament. Defence coach Andy Farrell has been a great appointment to a coaching staff that was already top class. AN: I think England will just shade it from Ireland but with no Grand Slam, so bonus points become very important indeed. How will the Six Nations finish?